Home Our Garage Door Services Garage Door Openers Do You Need a New Opener? A few years ago, perhaps you found the garage door of your dreams. It was safe, it looked great on your home's facade, it was noiseless and it operated smoothly. Lately, however, something seems to be wrong. Here are a few points to help you decide if the time has come to replace your existing opener. More modern garage door openers come with rolling code remote controls – essentially, the code changes each time you use the door, it makes it much harder for intruders to gain access to your code and get entry to your garage. You might wish to consider replacing your opener if your door is fairly old and not equipped with a safety reversal system. Contemporary door openers have sensors which detect movement at the lower part of the door. This means that if your child or dog runs towards the door while it opens or closes, the door will immediately freeze and reverse. This way you can avoid potentially fatal accidents. If your system does not have a properly functioning safety system, we really recommend replacing it. Do You Hate All The Noise It Makes? Many older door openers worked with a chain – these types can be pretty noisy. By replacing your door with a newer model, it is likely that you will reduce the noise generated by your opener. Take note though, that your door might also be louder than usual because some of the other parts of the system – perhaps the hinges, tracks or other parts need replacement. Before committing and spending any money, it's a good idea to get a professional to come and inspect your system to make recommendations. Are You At Risk Of Power Outage? 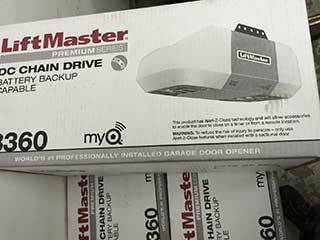 Almost all new garage door models come with a backup power system – with this battery backup in place, your system will start working again right after the power goes out. This means there's no risk you'll get locked inside your garage or be unable to go to work. If you'd like to discuss your new opener needs and requirements in more detail, don't hesitate to contact our repair experts in Ramona!